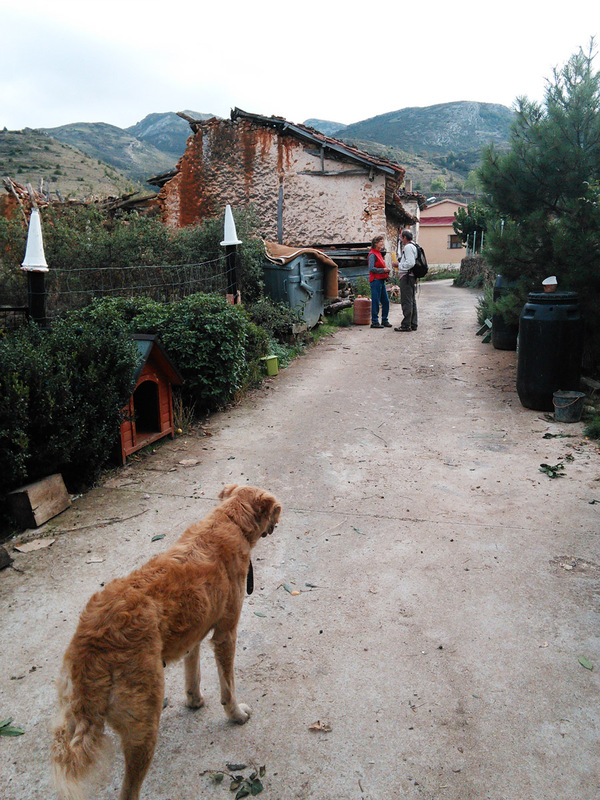 On our way to an International Union of Forest Research Organizations (IUFRO) conference in Montesclaros, Spain in 2011, Claire Kujundzic and I visited Dorien Jongsma at El Hacedor – Imágenes y Palabras in the tiny village of La Aldea del Portillo de Busto. 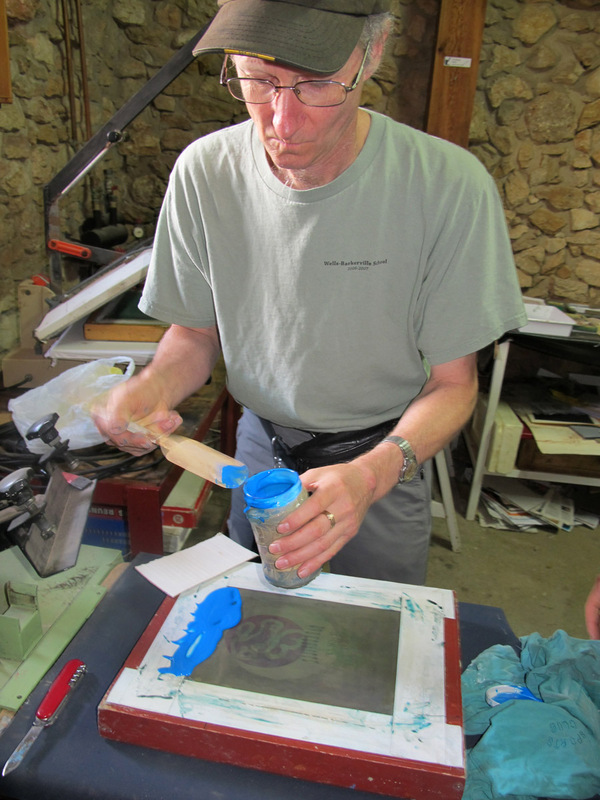 We each did some hands-on printmaking, and I did another screen printing demo there last fall. 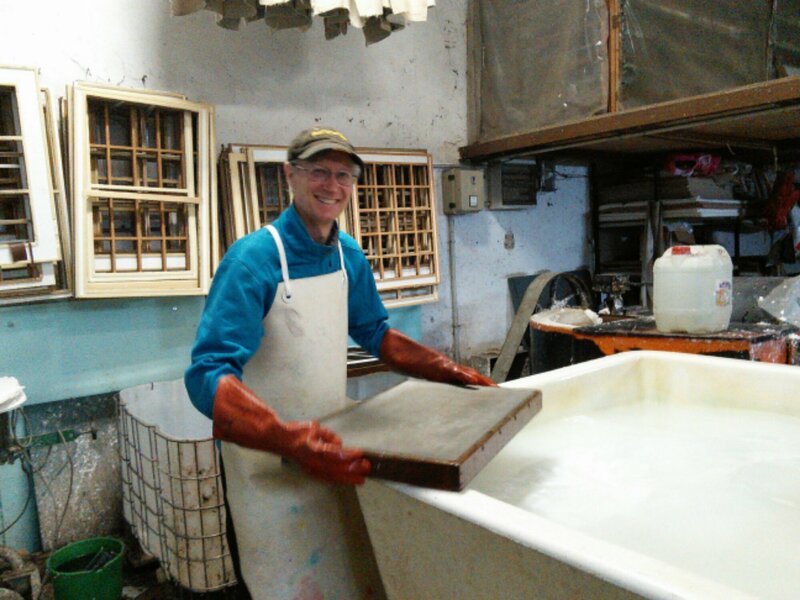 In our conversations with Dorien, we could all visualize the logic and beauty of a papermaking workshop there. When I told Juan Barbé about this unique art centre, he was immediately interested in meeting Dorien. And Dorien was interested in meeting Juan. I realized this could also be an opportunity to demonstrate a sunlight photostencil exposure and at the same time make an Eskulan logo stencil that Juan could use for printing on his papers or packaging, etc. So one morning during my last week in Tolosa-Billabona-Zizurkil, Juan and his wife Carmen Sevilla picked me up and we drove to La Aldea, with a blank silkscreen in the trunk and the jar of photoemulsion I had bought from Garikoitz at Boxa Arte Elkarte (see previous post). 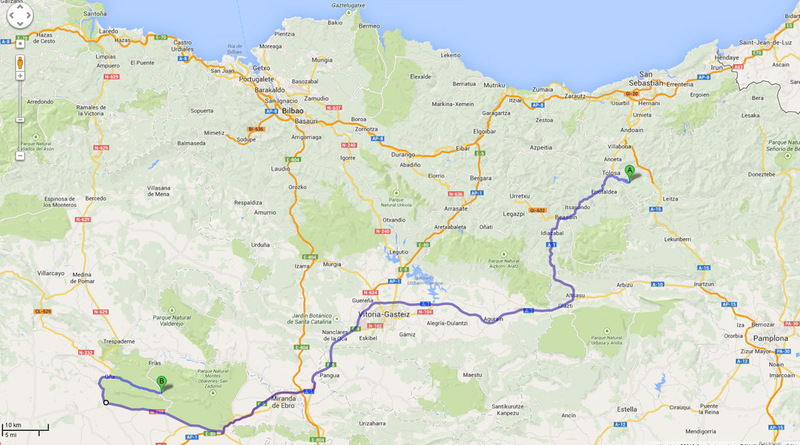 Our route from Tolosa to La Aldea. On our return, we took the BU-520 shortcut over the mountains to avoid looping back through Oña. Pancorbo, between La Aldea and Miranda de Ebro. It’s a spectacular drive through mountainous terrain, into La Mancha, and then back into wide mountain valleys. 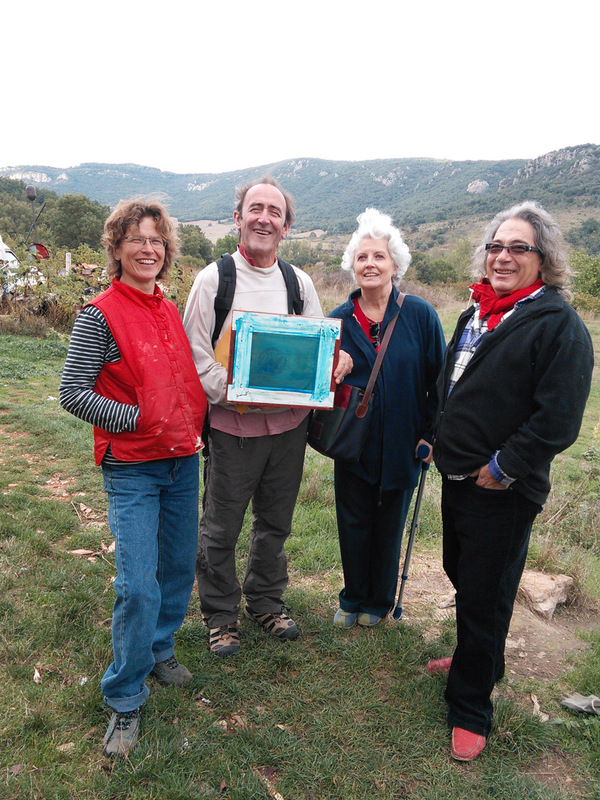 On our way, Juan and Carmen picked up some prize winning organic sheep cheese in La Barcina de los Montes from Isobel & José who are friends of Dorien’s – a gift for the table. 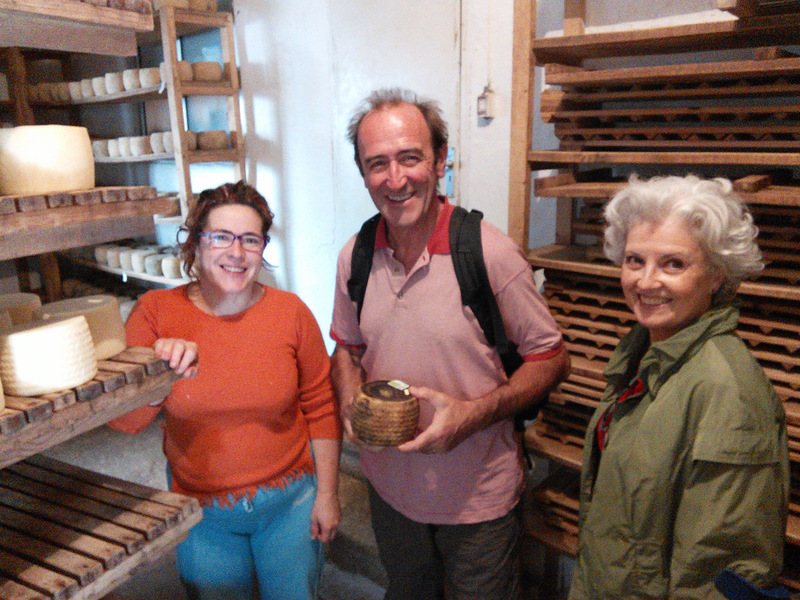 Isobel, Juan and Carmen at the cheese shop in La Barcina de los Montes. 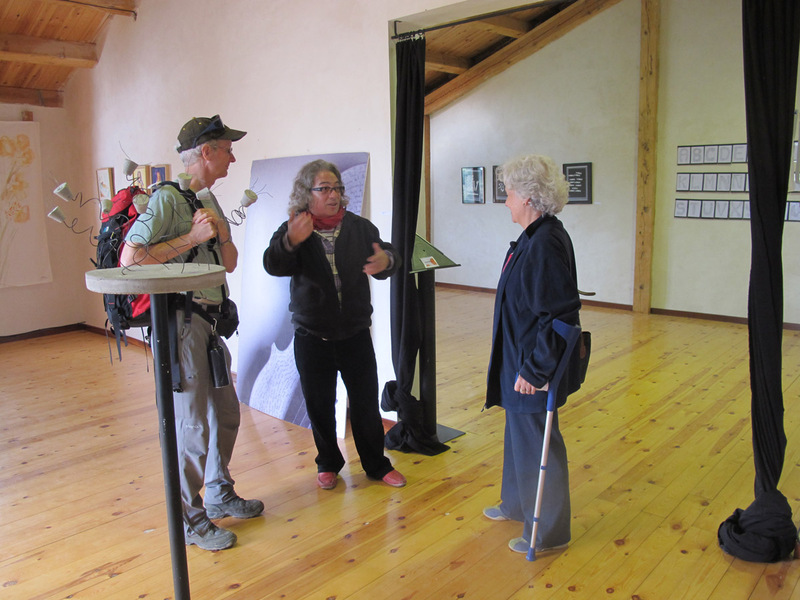 With Emilio and Carmen in the gallery. Juan Barbé photo. After a tour of El Hacedor, the gallery, and encantapajaros, plus a delightful lunch hosted by Dorien, Edo, and Emilio Zaldívar, I set up Juan’s screen outside. I had coated it with photoemulsion on arrival and set it to dry in a dark cupboard. 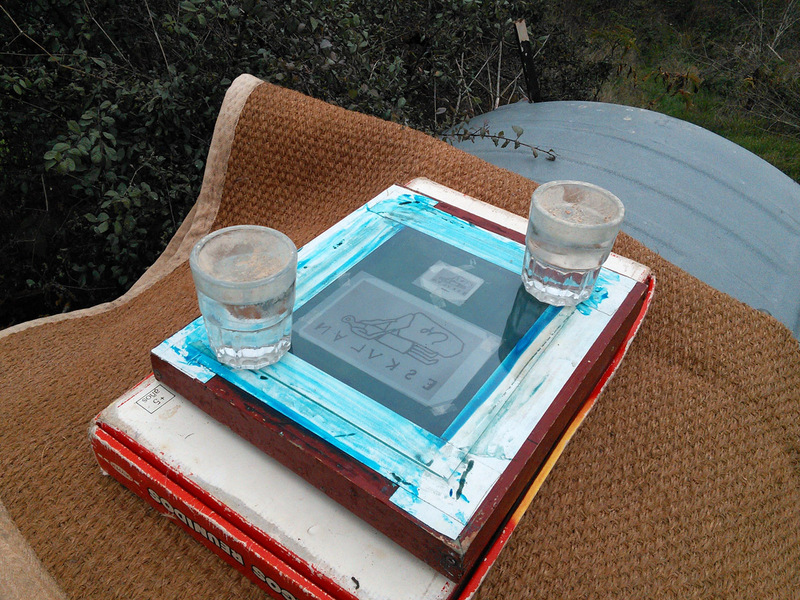 Coating Juan’s screen with photoemulsion. Juan Barbé photo. Ready to tidy up the emulsion. Juan Barbé photo. We were using two photocopies of the Eskulan logo on acetate, doubled up and taped together to increase the density of the black. The always-enterprising Dorien found me a piece of foam rubber and a sheet of glass, and I set them up outside in the daylight. 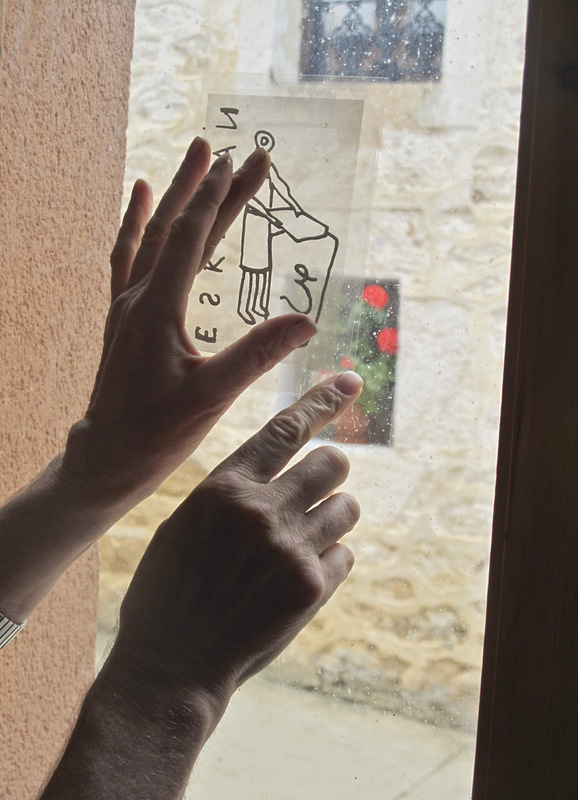 Using a window as a light table to align two photocopies on acetate. Juan Barbé photo. Sunlight exposure setup. Two weights tighten the contact betwen the glass, positives and screen. It was overcast, and I wasn’t sure of the sensitivity of this batch of emulsion, but I set a timer for 12 minutes. It’s always better to slightly over-expose and risk losing detail, because underexposed emulsion can be very hard to remove from a screen. Rinsing the exposed screen under a tap before using a plant sprayer with more pressure. Juan Barbé photo. Dorien, Juan, Carmen & Emilio with overexposed screen. 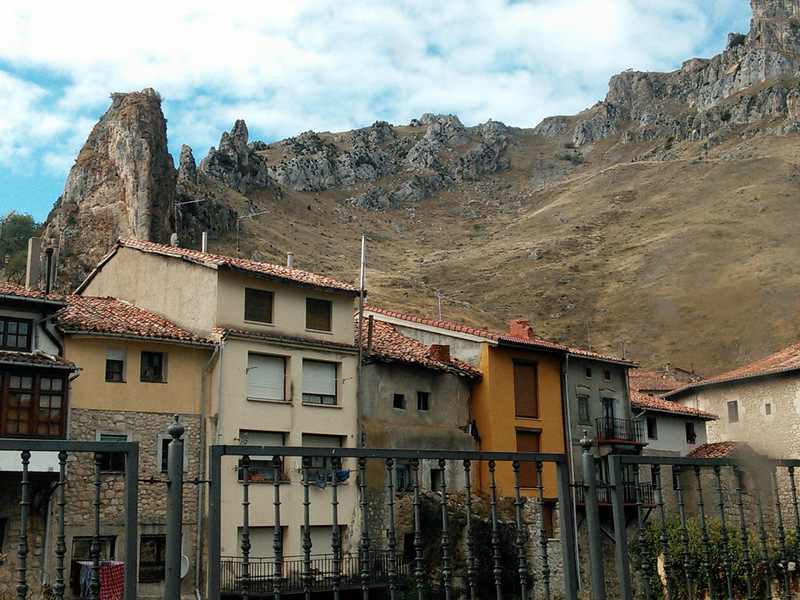 Dorien showed us how to drive back to Tolosa without going through Oña and bid us farewell. It was a long day, but rich with conversations, laughter and camaraderie. 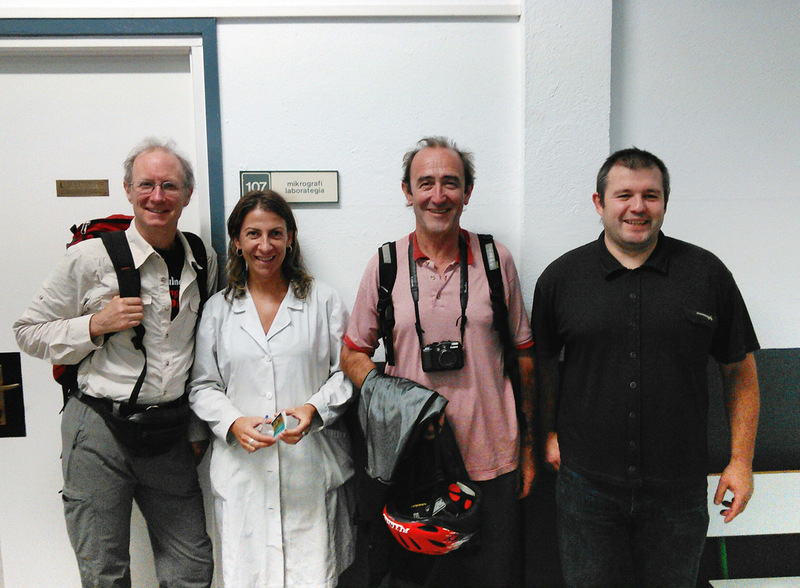 I’m grateful to Juan and Carmen for the excursion, and to Dorien, Emilio and Edo for their warm welcome. 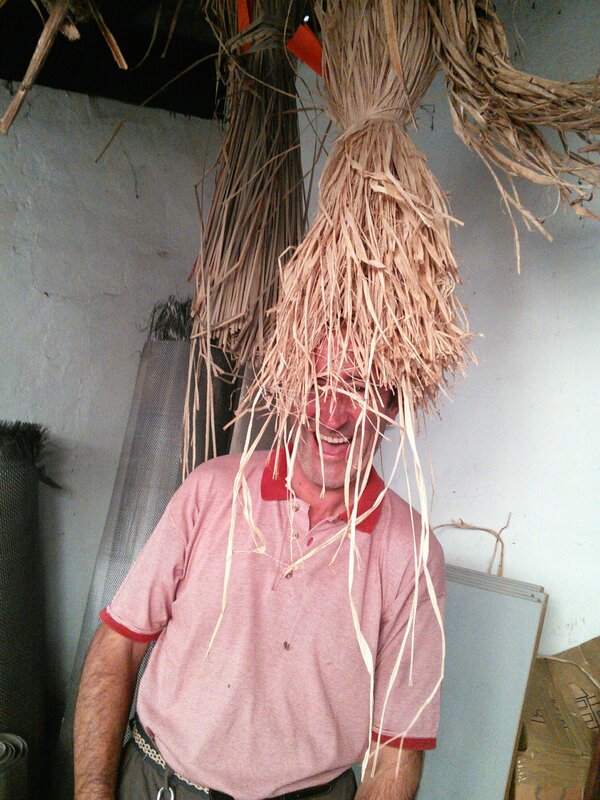 No doubt it won’t be long before Juan returns to El Hacedor to lead a workshop in papermaking or artists’ books. Dorien & Juan in conversation. 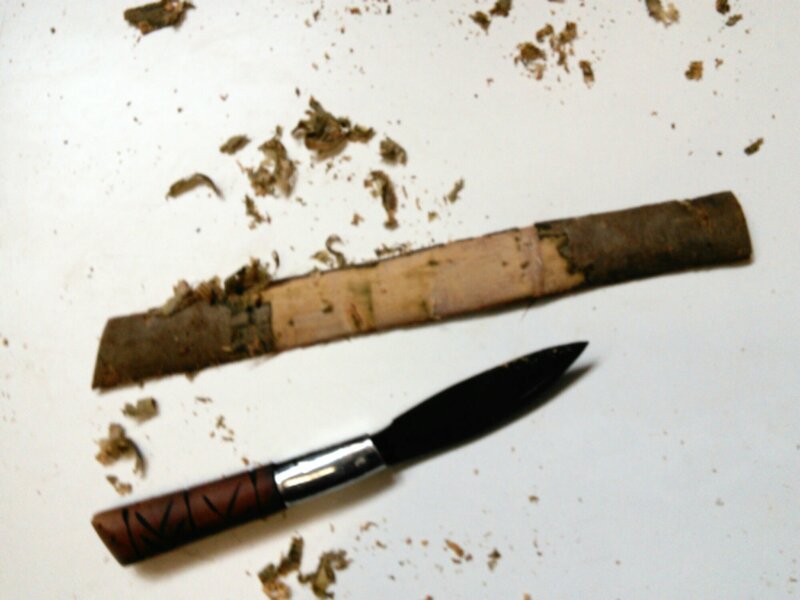 This entry was posted in art, paper making, Spain, Uncategorized and tagged art, Boxa Arte Elkarte, El Hacedor, Garikoitz Cuitlahuac Murua Fierro, Juan Barbé, paper, Spain on November 18, 2013 by Bill Horne. At the end of my last day at Eskulan, Juan and I walked back to the flat in Billabona where he and his wife, Carmen Sevilla live. While Juan busied himself in the kitchen, Carmen, a printmaker and book designer, showed me around their place and the many pieces of art they have collected over the years. Some were her monoprints; all were pieces beautiful in their own right. I had accompanied Juan earlier on his shopping expeditions, going from store to store to get all the necessary items. 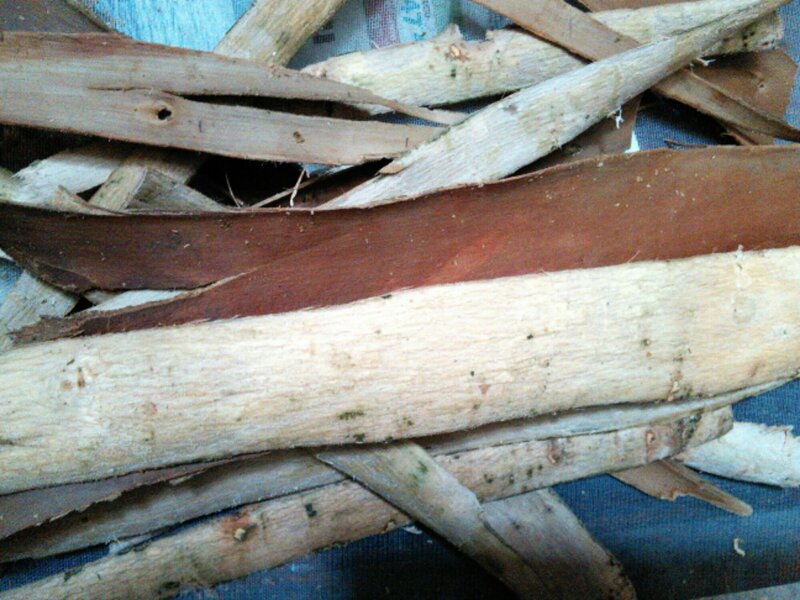 And I knew that an artisan like him who enjoys fishing, cycling, and patiently scraping bark would probably be an excellent chef. 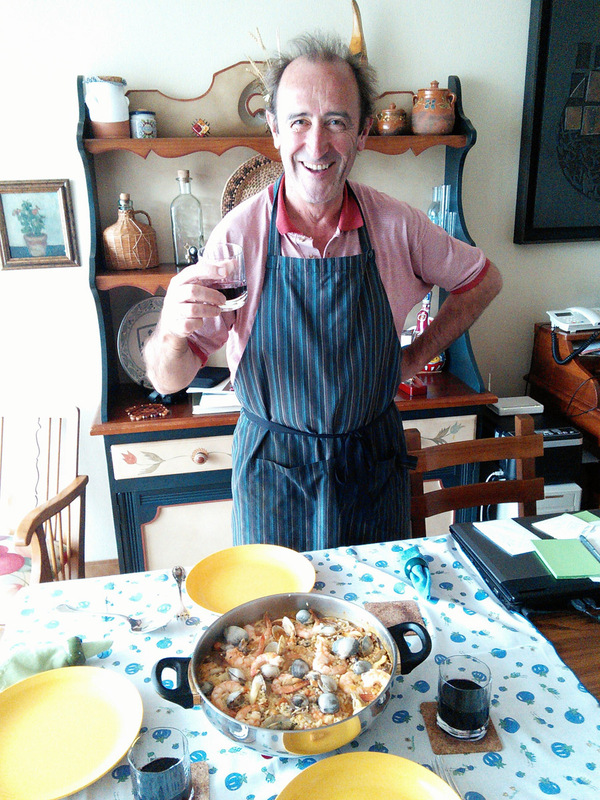 But the paella he served was absolutely outstanding – wow! What a wonderful gift to partake of, followed by a delicious fruit salad that Carmen prepared. After this fine lunch, they brought out their collection of artists’ books. 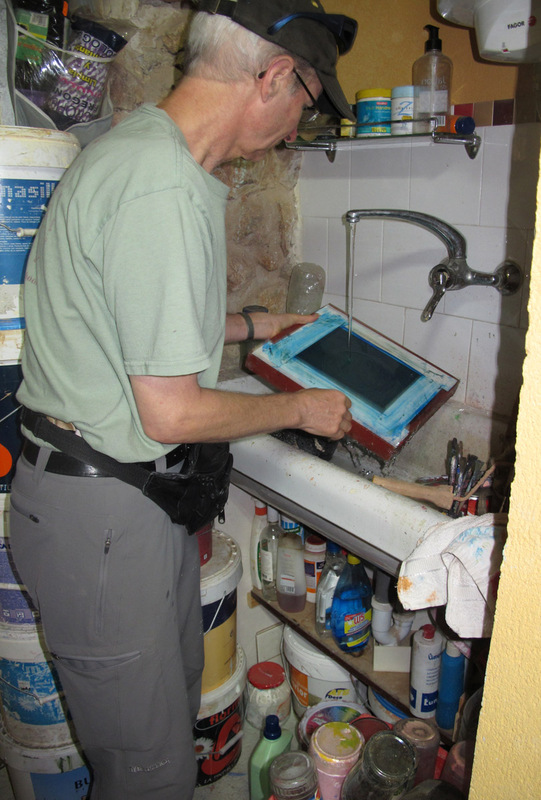 I knew that Juan sometimes leads artists’ book workshops, as well as papermaking workshops, so I was interested to see some examples. Several were one-of-a-kind books Carmen had made using letterpress on exquisite hand made papers or her own pulp painting. 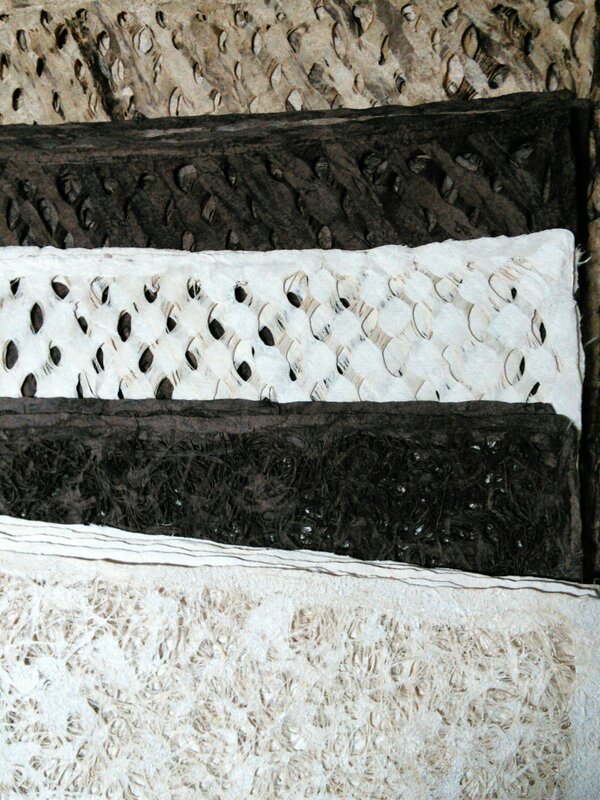 They were stitched in innovative and traditional ways. Juan had been telling me how ingenious Carmen is with book design and bindery, and he was right. One of her pulp painting books evokes the coastline and crashing surf of Asturias where she is from; another conjures up forests. Anyone who has ever attempted pulp painting knows how much labour, skill and serendipity go into this process. 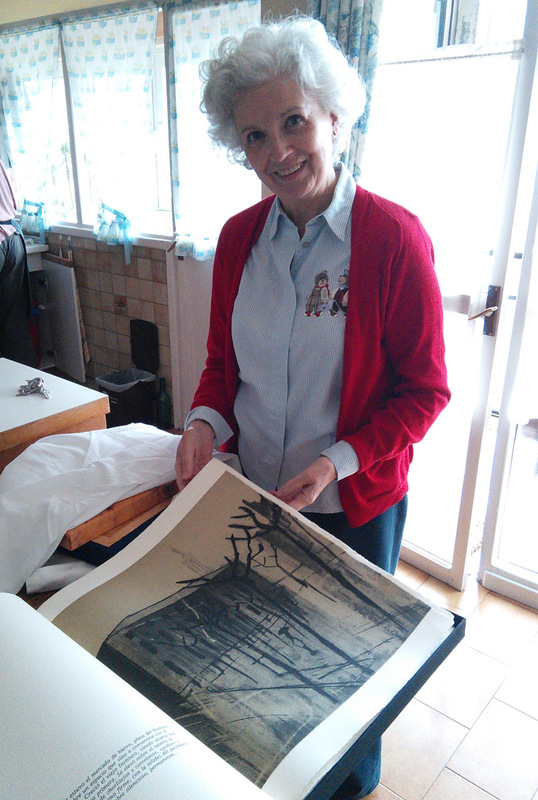 She generously gave me a copy of a catalogue of her pastels published by the Caja de Asurias in 1997. Sparse, gorgeous work. 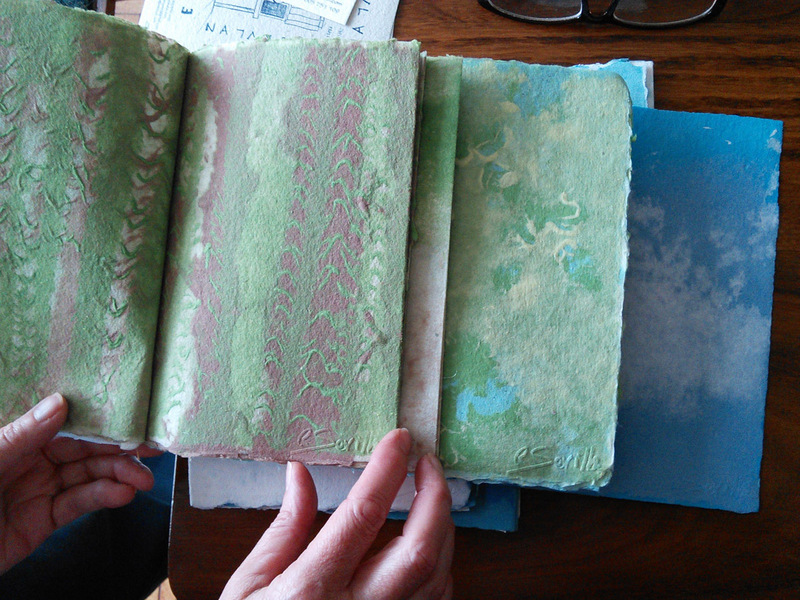 Innovative stitching and folding show in this example of Carmen’s artist’s books. 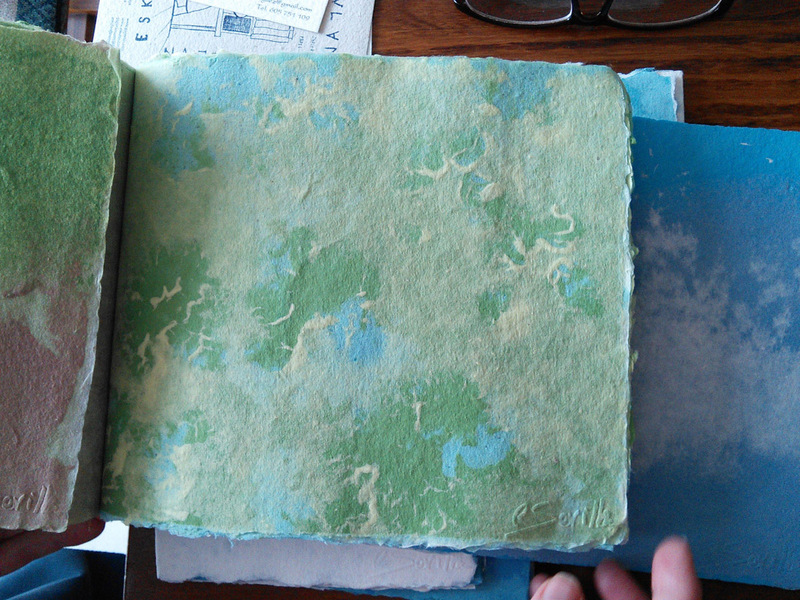 Carmen’s forest book made entirely of pulp paintings. Another page in Carmen’s forest book. Closeup of a page in Carmen’s pulp painting forest book; note her “chop” at the corner. 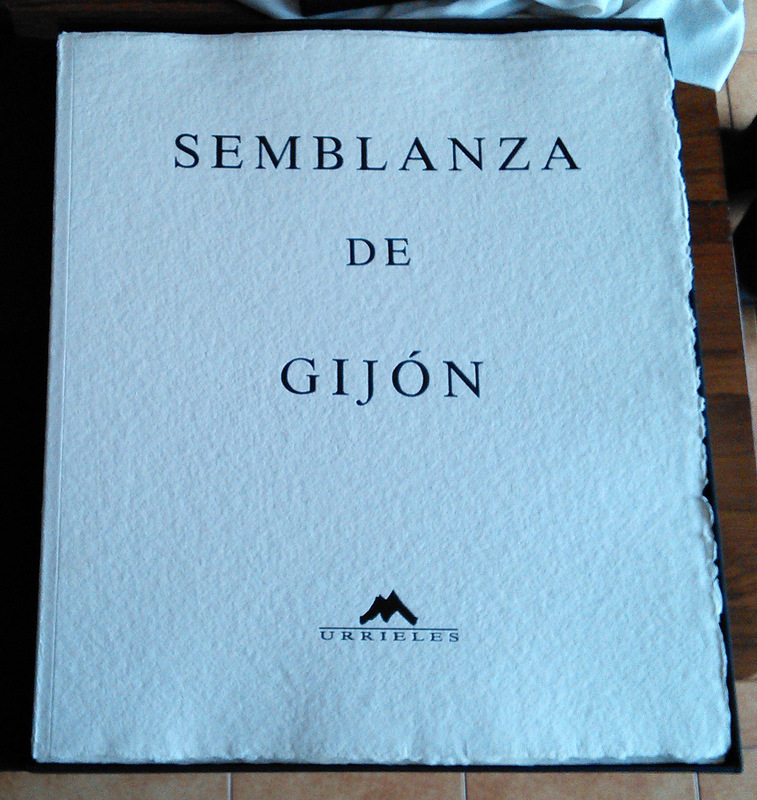 Semblanza de Gijón was one of Juan’s first commissions as a professional papermaker. It’s a boxed edition of 75 books printed with letterpress and etchings by Pelayo Ortega on his hand made paper. Traditional Spanish binding allows the reader to fully open the book without it cracking or breaking. 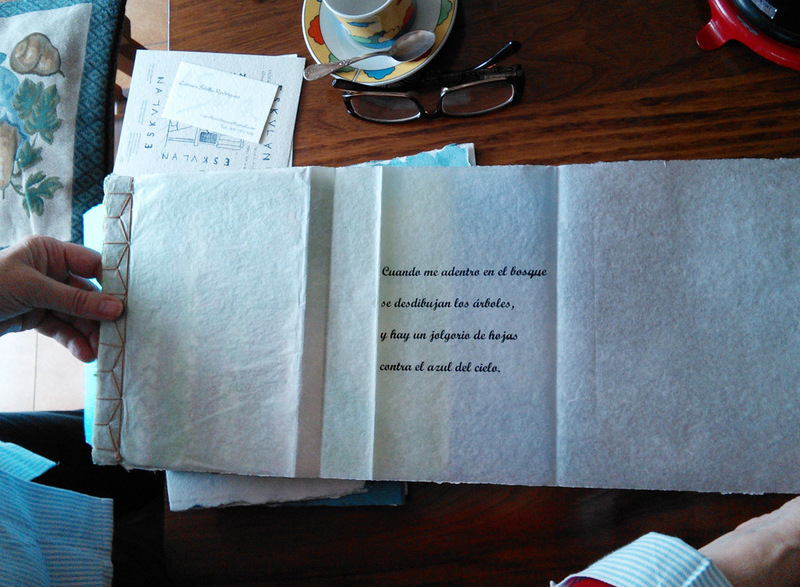 Carmen leafs through their copy of Semblanza de Gijón. The sepia toned etchings bleed off the outside edges. Juan showed me what he described as his “only book”: a leather-bound journal of stitched, hand made paper. Each page documents a fibre he has made into paper, with its characteristics, time boiling in lye, time in the Hollander beater, etc. 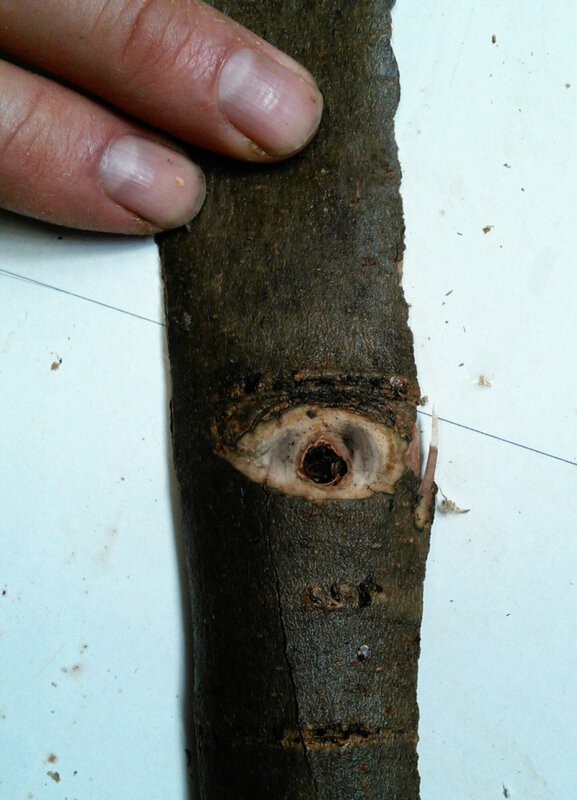 Each has a small sample of the paper attached. Truly a one-of-a-kind document in the world – a live, ongoing and dimensional parallel to Lillian Bell’s classic “Plant Fibers for Papermaking”. A life’s work in progress. All these are precious objects that would win the top prizes at international book fairs. Carmen and Juan, though incredibly modest, are masters of their arts and crafts, among a handful of such people in the world, and I’ve been extremely fortunate to spend time with them. 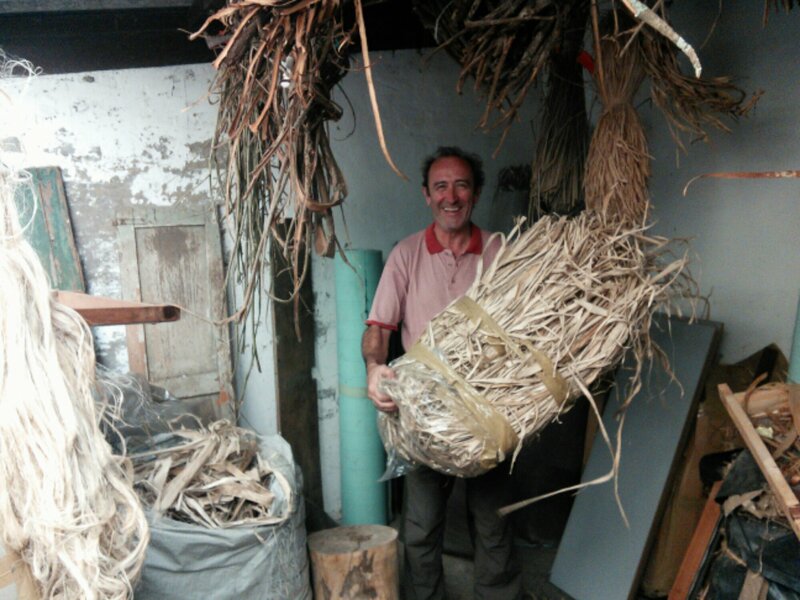 This entry was posted in art, Euskal Herria, paper making, Spain and tagged apprenticeship, art, paper, Spain on November 6, 2013 by Bill Horne. 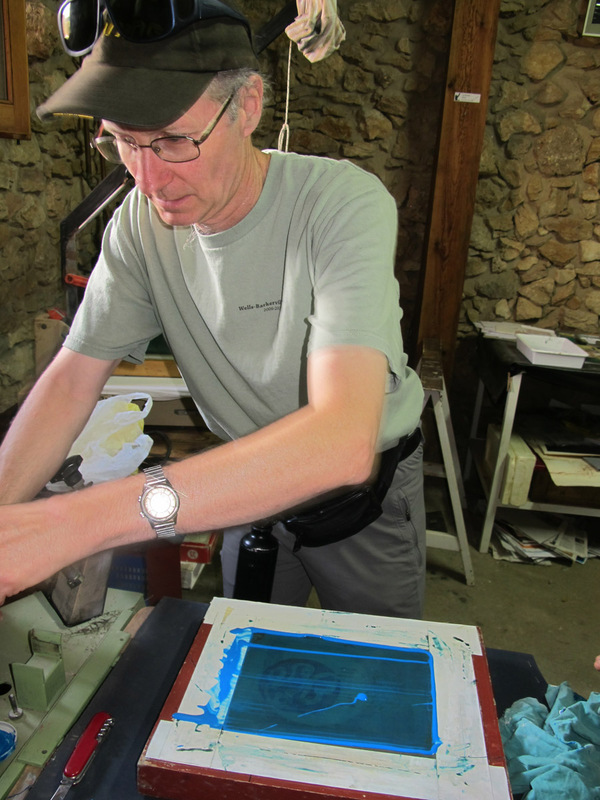 I met Juan Barbé serendipitously in 2012 through the Tolosa Paper School (EPT). 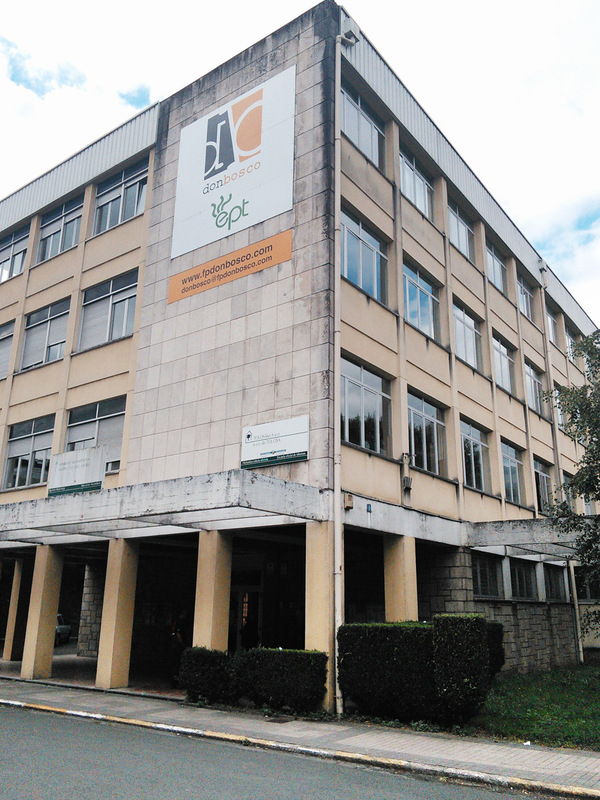 I had planned to visit their facility and gift them one of my prints of Broom silkscreened on Broom paper, but by the time I got to Tolosa, Vicky at the EPT explained that the school would be closed for a holiday that day. However, in lieu of a tour, she asked if I wanted to meet a former student, Juan. 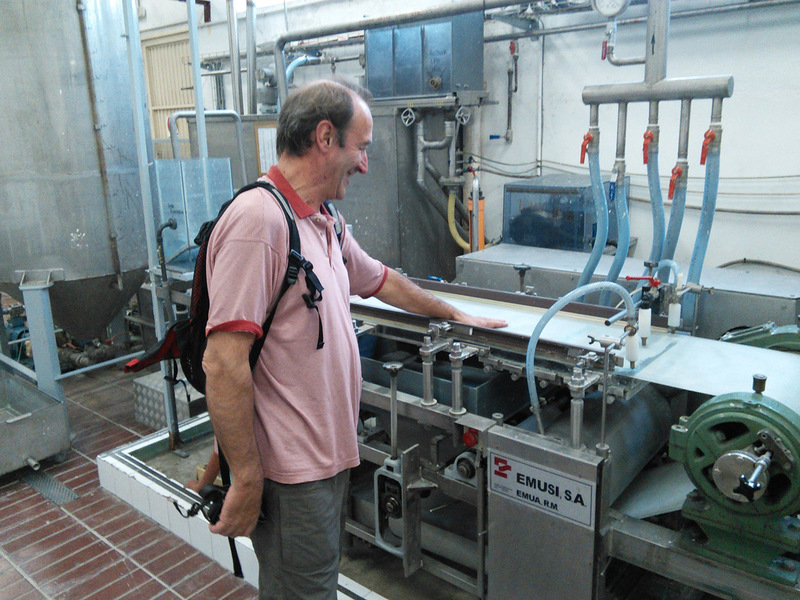 Juan explains how students operate the school’s production line. One of the first rooms we entered has a scaled down version of a typical paper mill production line with rollers, felts and cutters. This permits students to practise their skills and mechanical abilities with real equipment. At the end of the line is a large bin with crumpled paper tests destined for recycling. Another room has an amazing collection of scales, beaters and pulping machines. 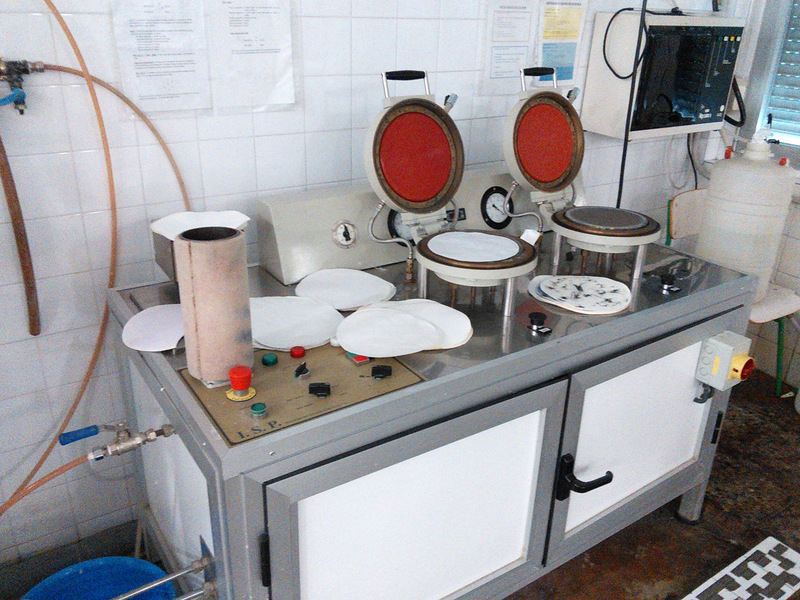 Some units are used to make circular test sheets; one device delivers pulp under pressure. The school’s café has wall displays that illuminate the papermaking process. We were immersed in paper theory and practice! 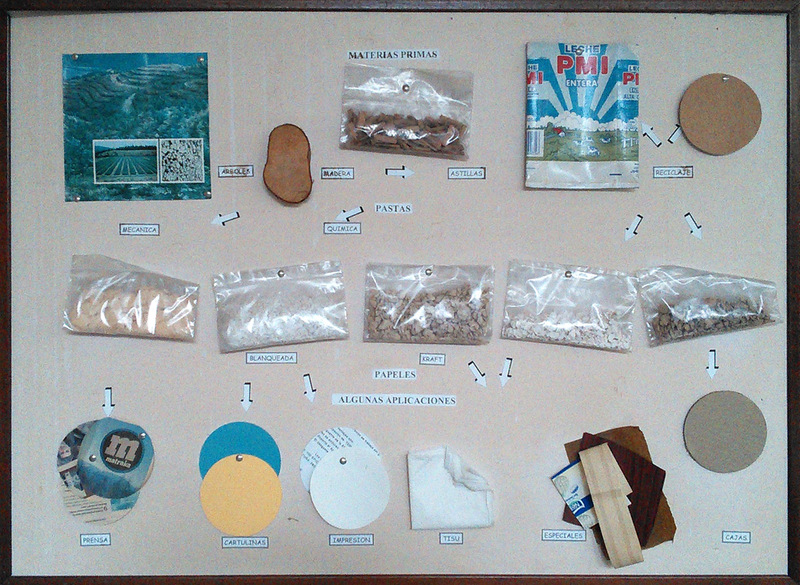 Wall display about paper production. Idoia Egurdibe showed us around the laboratory, which is full of microscopes, scales, chemicals for analysis, samples of various wood species and a digital microscopy unit. This is what Juan and others use to examine the fibres they work with. At some point he’ll use it to make micro-photographs of the Rumex crispus paper we made, along with the Fresno and Adelfa. 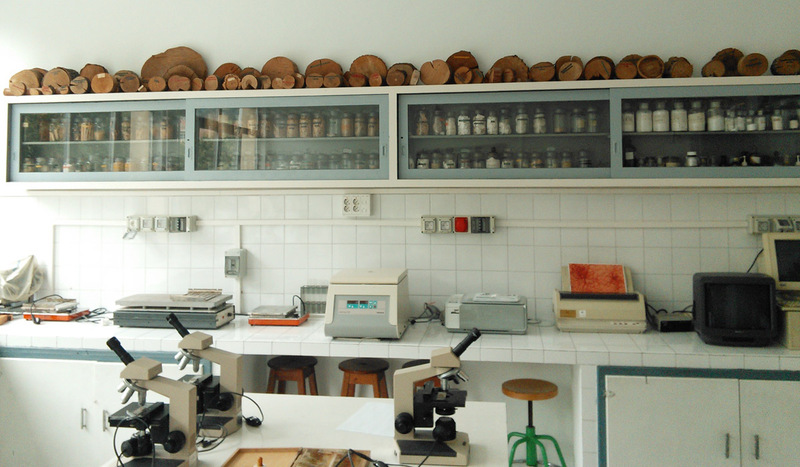 One side of the school’s laboratory. 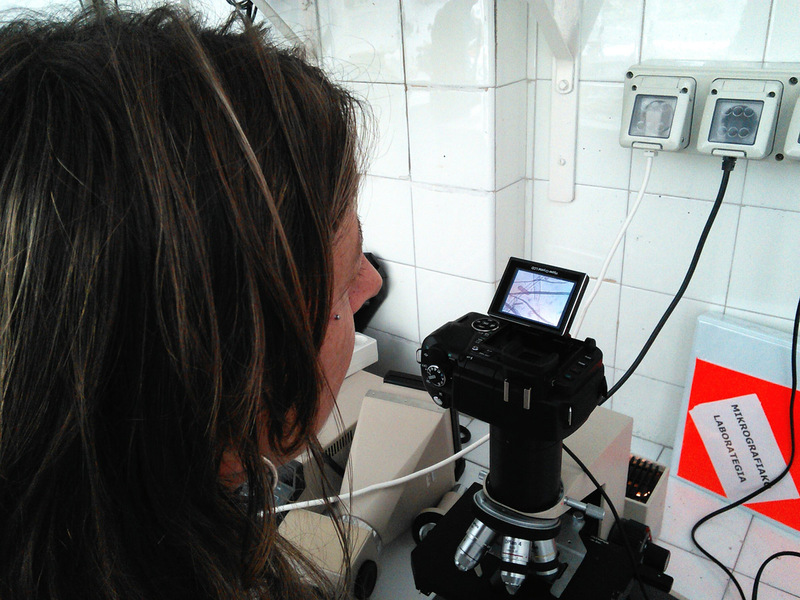 Idoia Egurdibe operates the school’s micro-photography unit. Pablo and Idoia were very generous with their time and kindly gave me and Juan copies of a new DVD history of the school. Eskerrik asko! To learn more about the school, visit their website. Bill Horne, Idoia Egurdibe, Juan Barbé & Pablo Eguskiza. 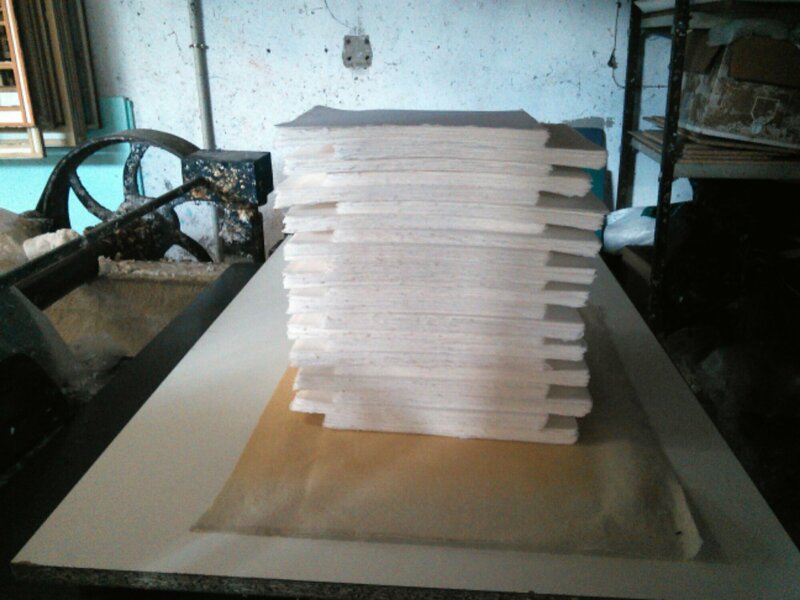 This entry was posted in art, Euskal Herria, paper making, Spain and tagged apprenticeship, art, paper, Spain on November 3, 2013 by Bill Horne. 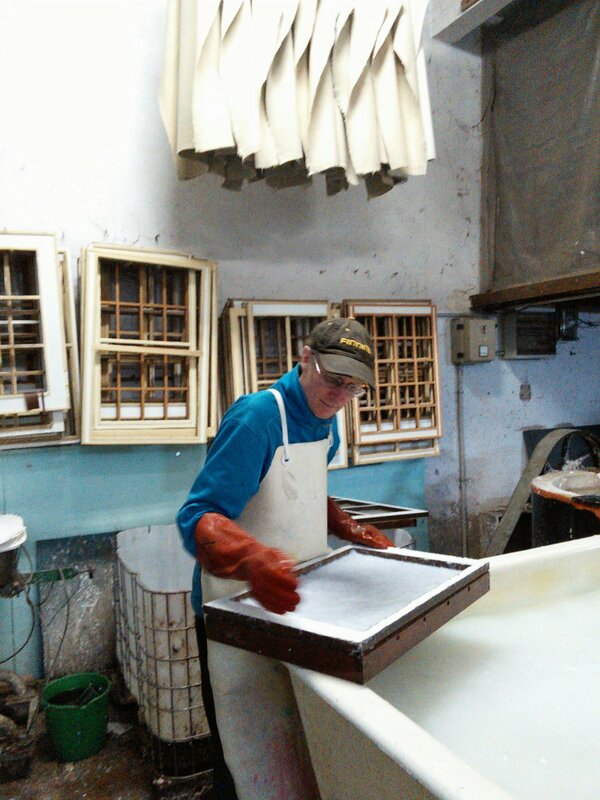 For their typical production runs, Juan and Javier use a classic western paper making technique which consists of scooping from a tank of pulp onto a screen with a deckle attached. This requires an excess of pulp and regular top-ups, as well as skill and acute awareness, in order to maintain sheet consistency. At a certain point, though, there’s not enough pulp in the tank to dip a screen into, so they drain and strain the tank, then squeeze the remaining pulp into balls. 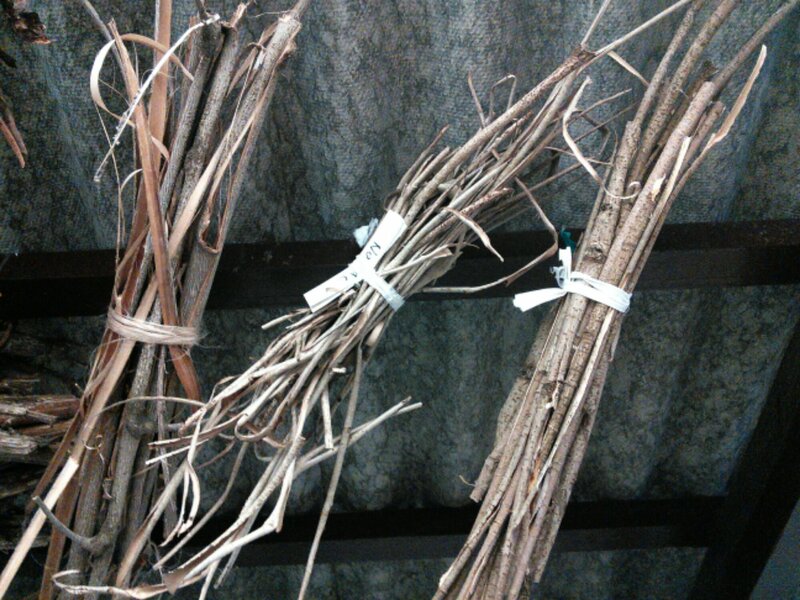 Dried out, they can be rehydrated later and used again in another batch. 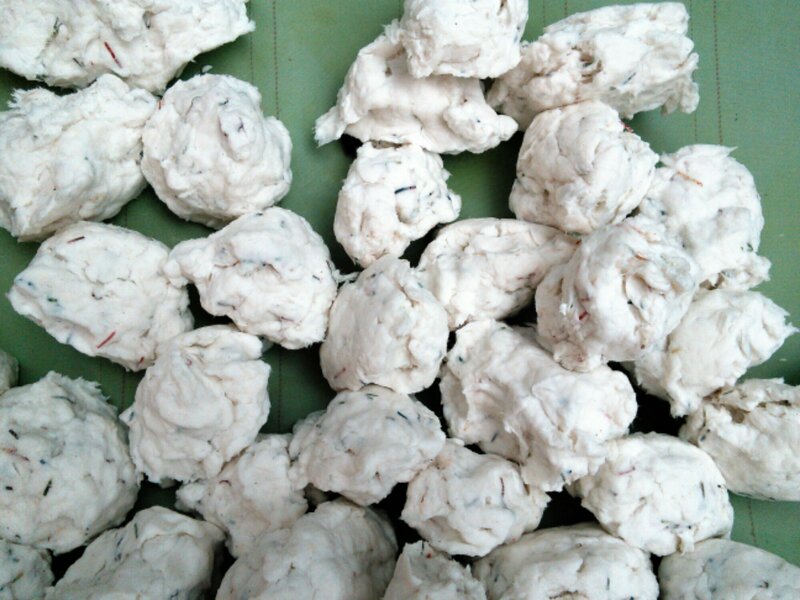 With the Nepalese style, it’s possible to use all the pulp, which offers an important advantage when working with a small test batch, especially a plant fibre that has required so many painstaking steps. 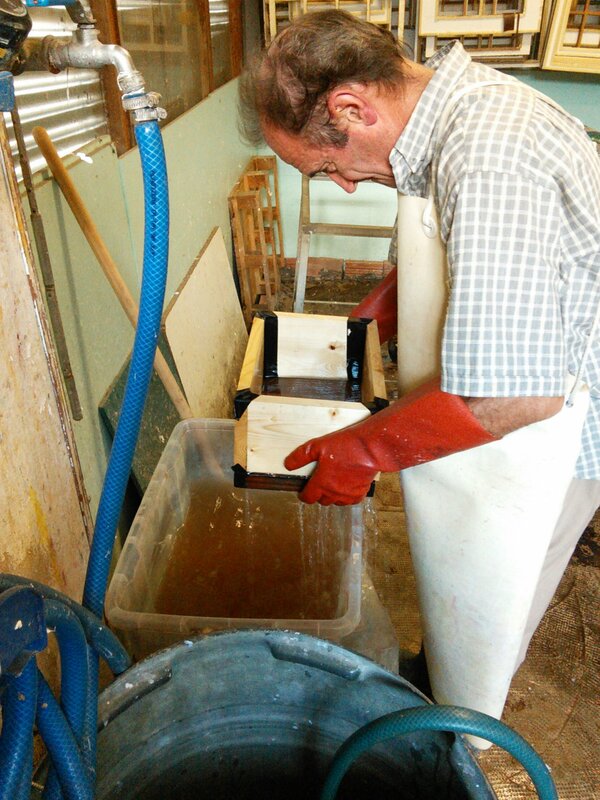 For our Rumex crispus test, Juan filled a small rectangular container with water beside our bucket of fresh-milled pulp. He placed a screen at the bottom and held a deep-walled deckle tightly to its upper surface. 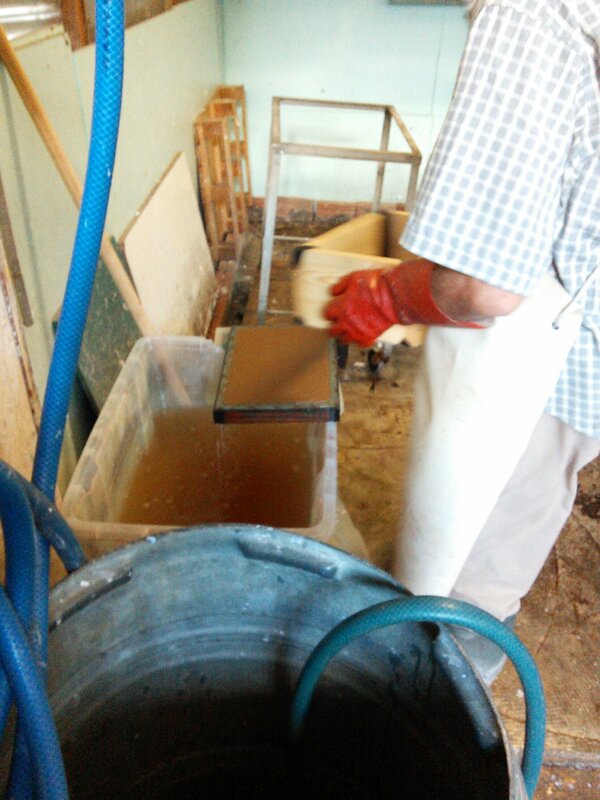 With his free hand, he scooped a cup of pulp from the bucket and poured it into the deckle, which was 3/4 full of water. Then he lifted the screen and deckle straight up. 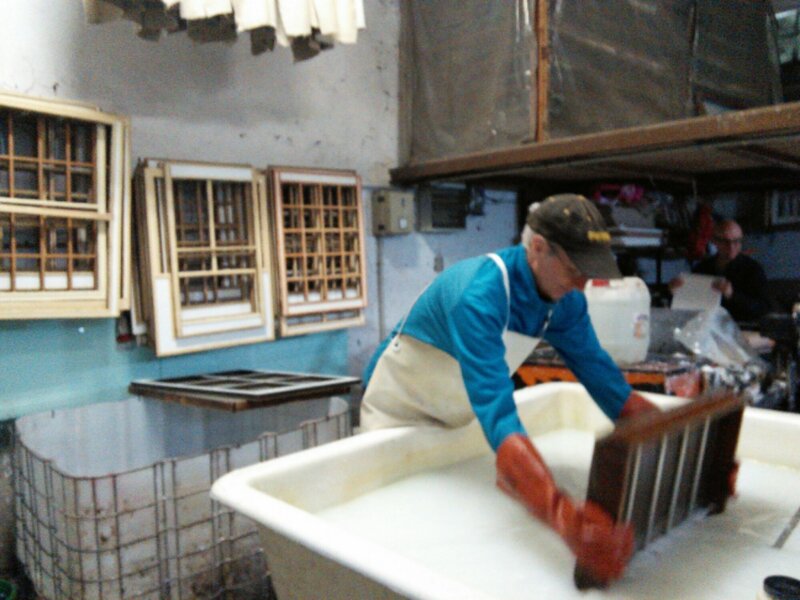 The water poured out and the pulp remained on the screen, ready to be couched onto felts. 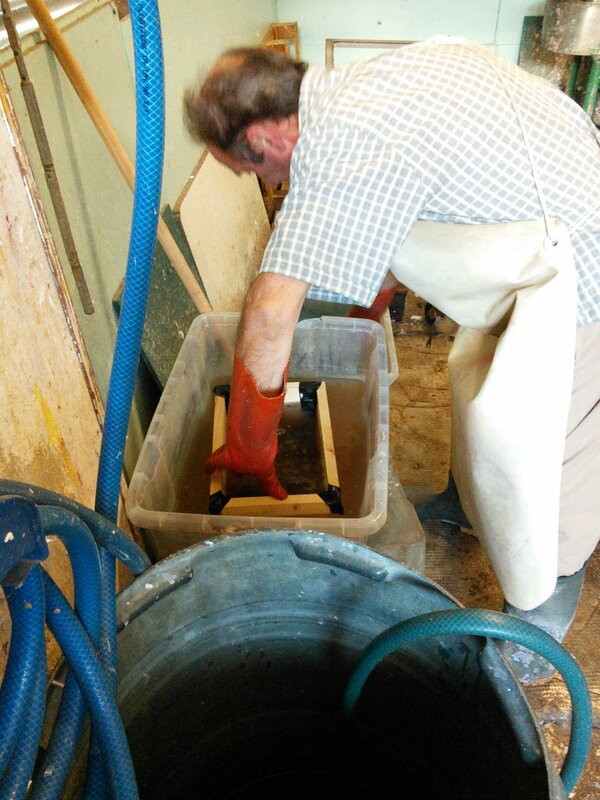 Each time he poured the same volume of pulp into the deep deckle, which ensured consistent sheet thickness. Very simple, very efficient. 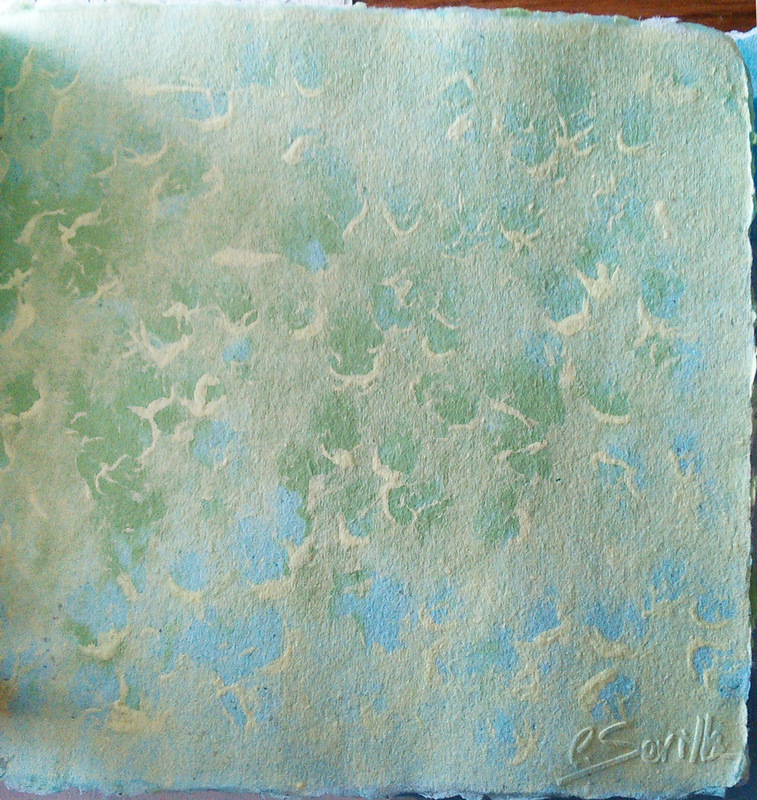 This entry was posted in art, Euskal Herria, paper making, Spain and tagged apprenticeship, art, paper, Spain on October 23, 2013 by Bill Horne. Juan lets me try dipping some of the deluxe 6-up sheets, and I don a giant, waterproof apron and long rubber gloves. I had never made such a big set of sheets in my life, and my technique was pretty bad! My first attempt was a total write-off and we had to rinse off the screen to start over. The next ones were marginally better, and luckily for me, the press compressed the flaws enough that they would be invisible to the untrained eye. 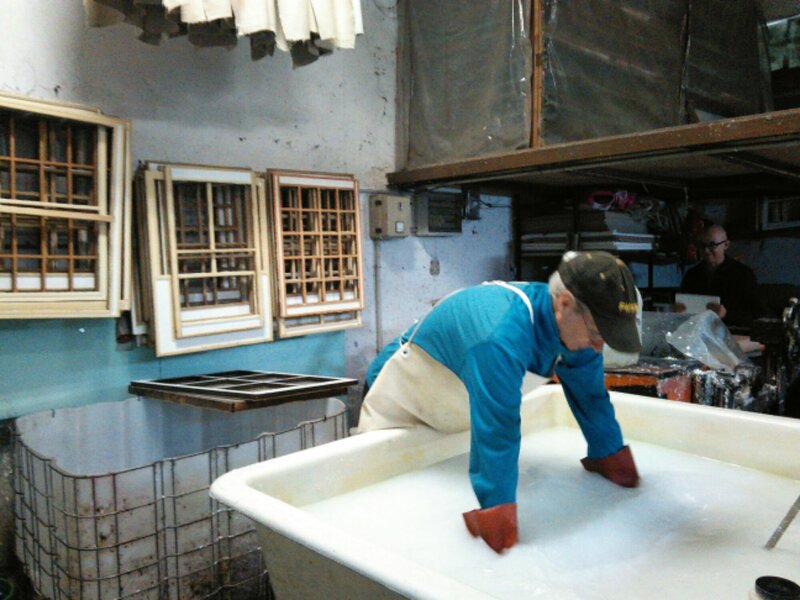 The trick is to plunge the screen & deckle vertically, quickly & deeply into the tank of pulp, until it’s immersed about 75%, then smoothly start pulling up to the surface, ending with a subtle rocking motion. 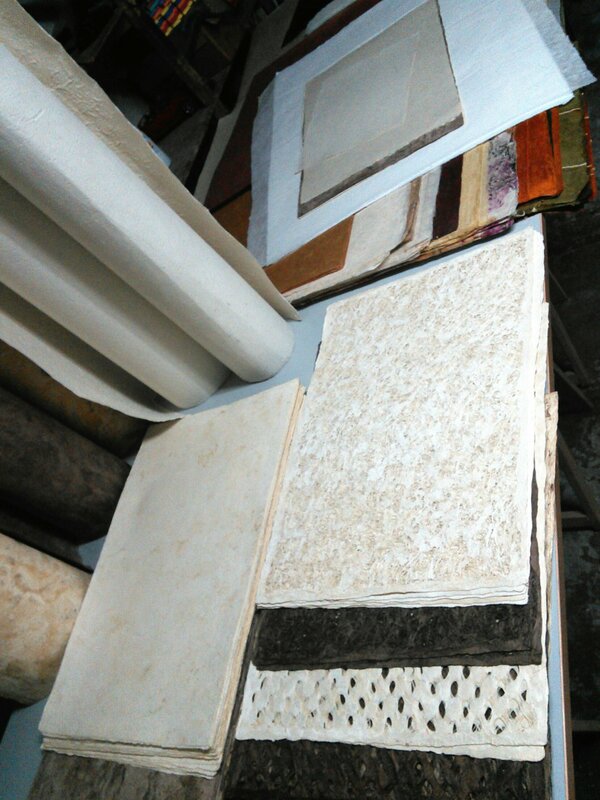 The deckle is made from a dark glue-lam with the sheet forming areas cut out and a narrow border of sponge crazy-glued around all perimeters. It’s fragile; another item to handle carefully and methidically. We couch the wet sheets onto a table at waist height, and I manage to place the edge of the screen at its correct middle point on the edge of the table, then quickly tip it down, press firmly, rub each channel and snap it up to release. To do this without the wet paper falling off the screen takes skill and confidence. This part I can manage. 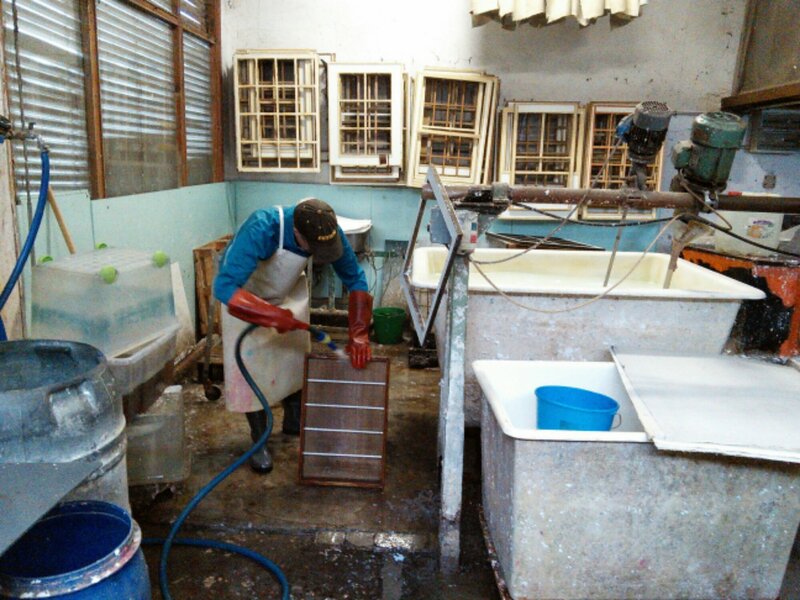 It’s very hard to teach the correct pulp dipping maneouver, however, because the tank of pulp is opaque – it’s impossible to see exactly what Juan’s hands or the screen are doing below the surface. Something to learn by hand with lots of practice. My next attempts are with a smaller screen and a single sheet deckle! 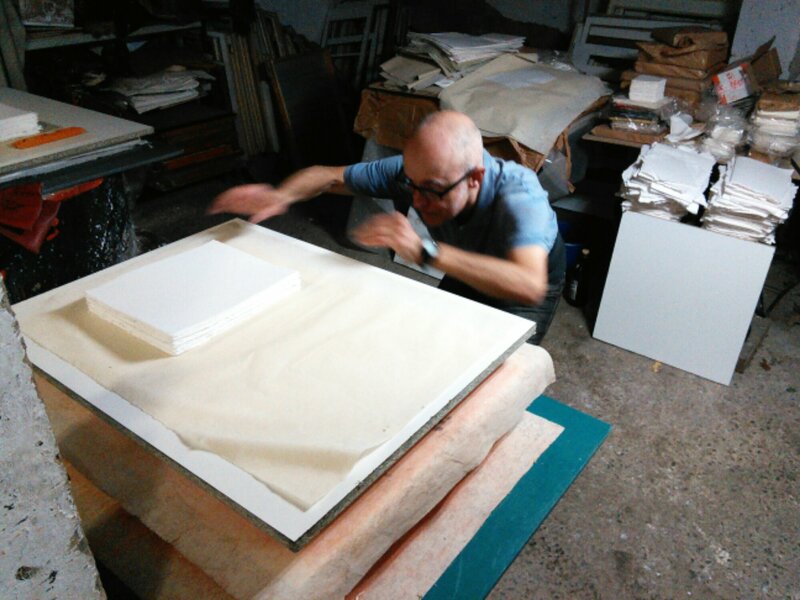 When the fresh paper has dried enough on its drying sheets that hang off lines upstairs, Javier peels them all off and piles them meticulously onto a heavy PVC sheet. 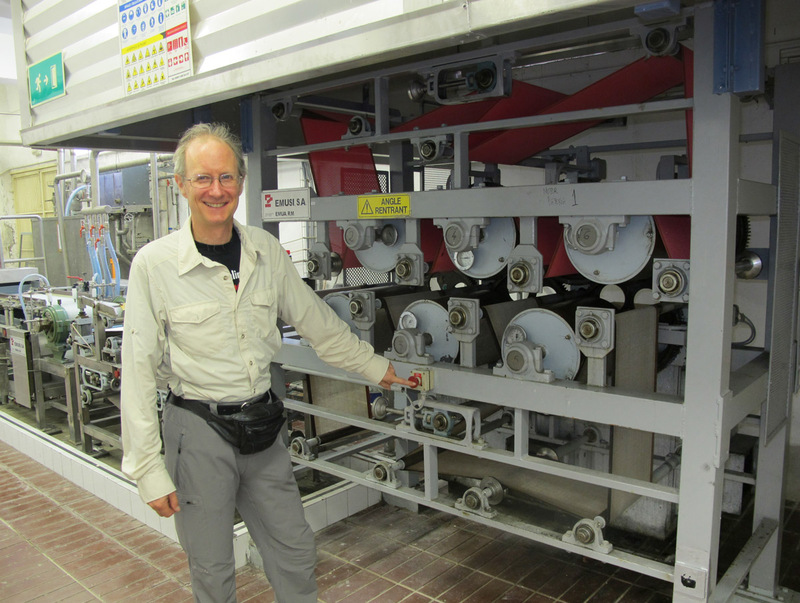 These go back into the press for a final flattening at a lower pressure. When they emerge, he stacks and counts them, then packages all up for eventual shipping. But it will take days of production to fill this order. 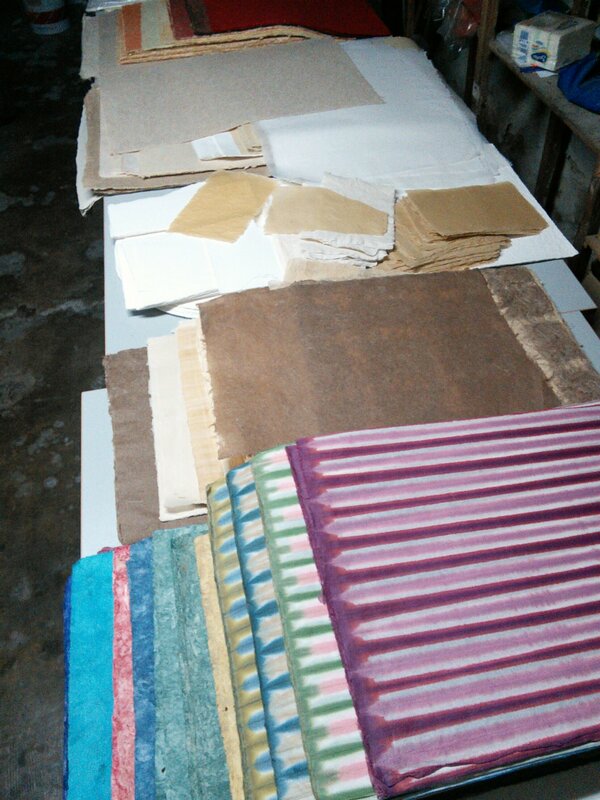 The day ends with cleanup. 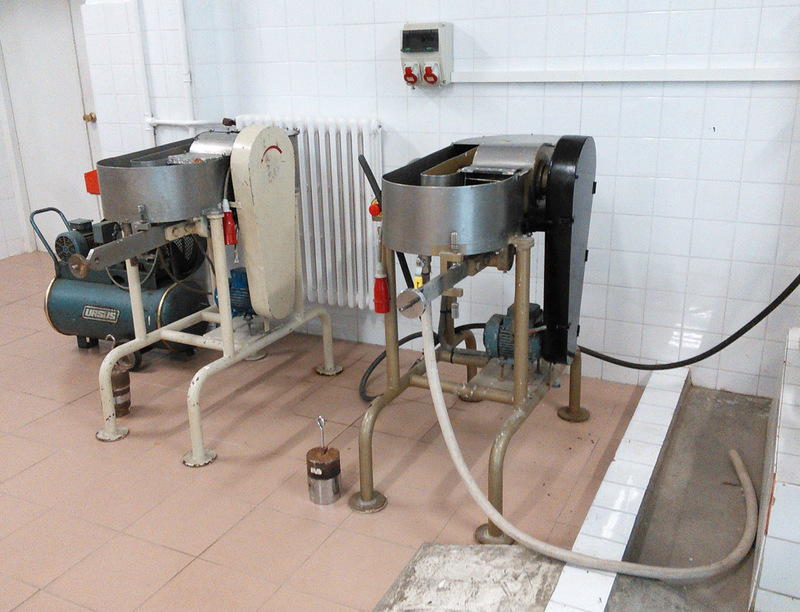 The screens and deckles get hosed down to avoid any pulp drying on them – very hard to remove later. 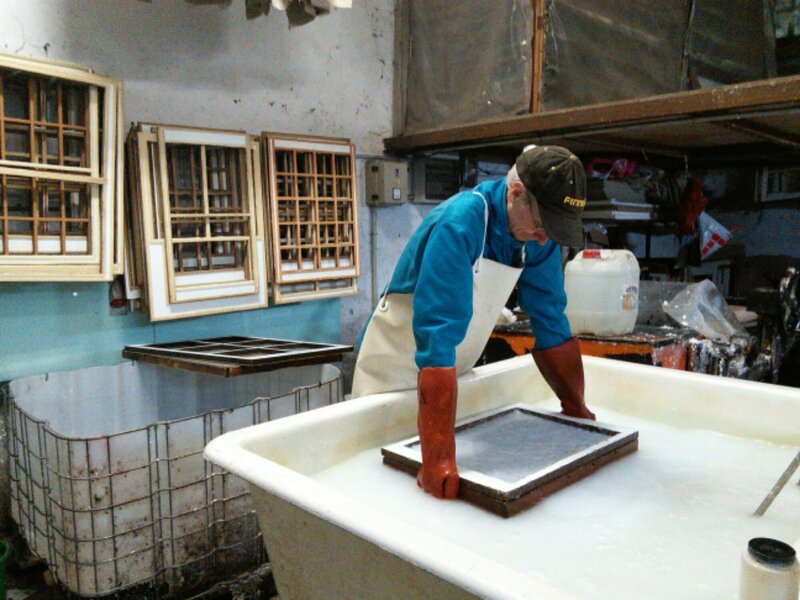 Like silkscreen printing, cleanliness preserves the investment in equipment, as well as making it possible to produce a quality product. All photos of Bill in this post courtesy of Juan Barbé.